This past weekend, we were at Create and Cultivate at The Ace Hotel. It was a weekend of meeting new friends and learning new things. 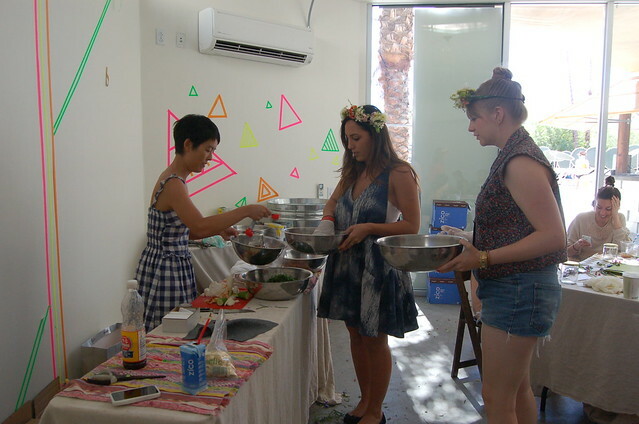 Throughout the two days, there were a variety of workshops ranging from finding inspiration in film, to making flower crowns, to making macrame planters. Chelsea Mathews of No Subject LA (the organizers of Create and Cultivate) invited us out there to talk about Poketo and do a creative, hands on workshop. For the win! Angie and Catherine. Doing a fake class, a test run of “The Making Kim Chi” class before the event. Talking about Poketo, no problem. We’ve done it a number of times at Universities, art schools, and even Creative Mornings. The hands on workshop was going to be something brand new for us. 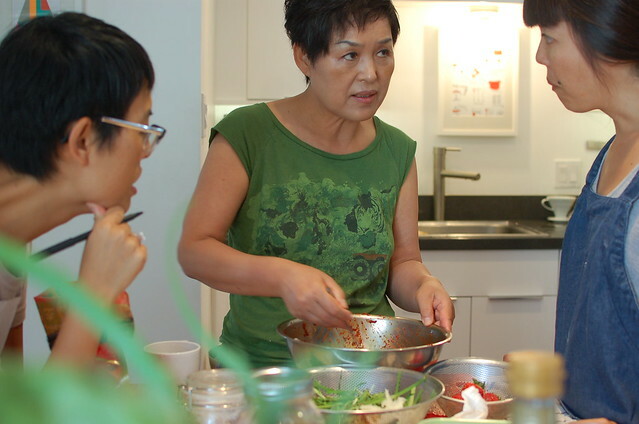 After a little brainstorm, we knew we wanted to teach something fun, something we love, and something that probably not too many people (except for Korean mothers) know about. So, it was decided, a Kim Chi workshop! 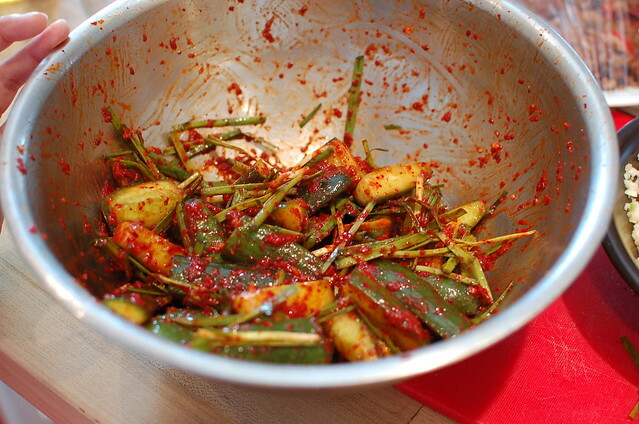 Kim Chi is a traditional Korean dish that is pickled and fermented. As you may or may not know, there are close to two hundred different kinds of Kim Chi made from cabbage, radish, scallion, cucumber, and other deliciousness. 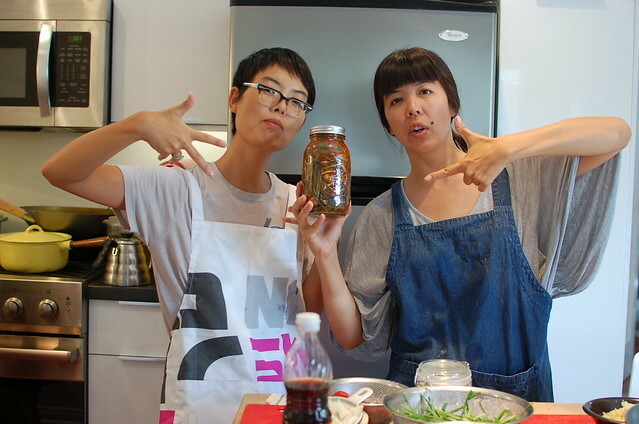 We had a limited time for the workshop, so, we decided on an easy cucumber and chive recipe from Angie’s mom. This recipe is easy to make and takes very little time. 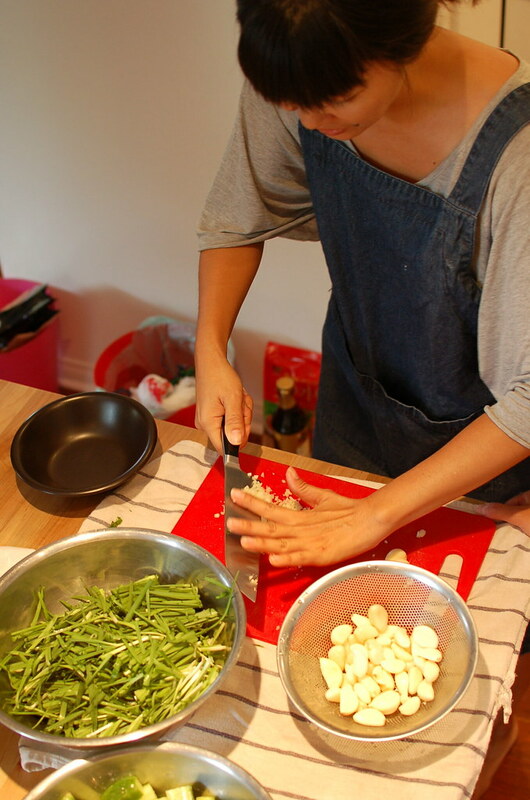 Other recipes like, a traditional cabbage Kim Chi, takes hours of prep and patience. 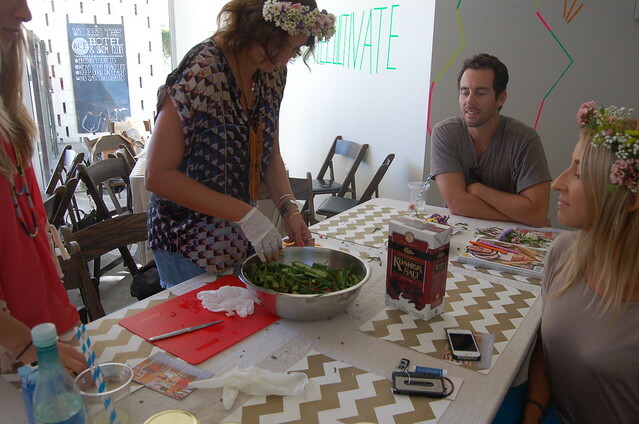 As a test run for the Create and Cultivate class, our friend Catherine of CakeIsSweet came over and we all learned from the best…. Angie’s mama. So, here we go… some pics that go through some of the step by step, a fairly detailed written instruction (below), some pics from the test run at our house, as well as, the real deal at Create and Cultivate. The recipe below will make about 4 (16 ounce) jars. Enjoy! Here are the photos of the real deal! 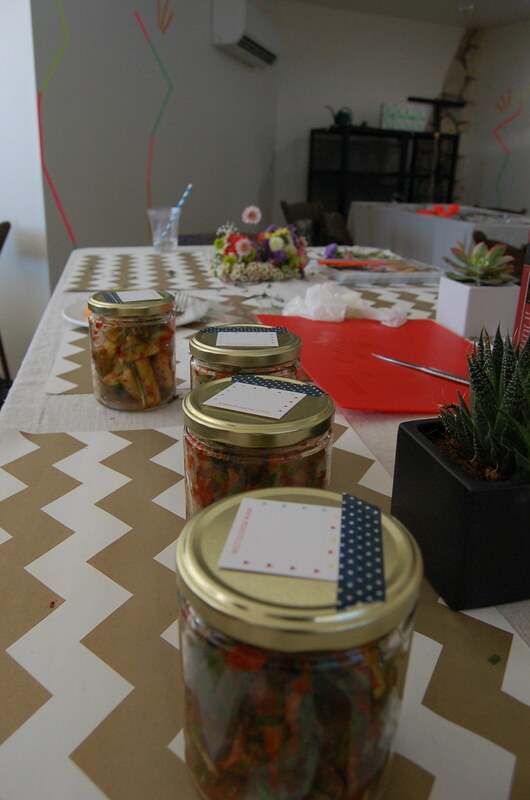 Use a little washi tape and tag for cuteness on the outside of the jars. 1. Bathe and scrub cucumbers in a bath of kosher salt, lightly scrubbing the skin with your hands and salt water. 2. 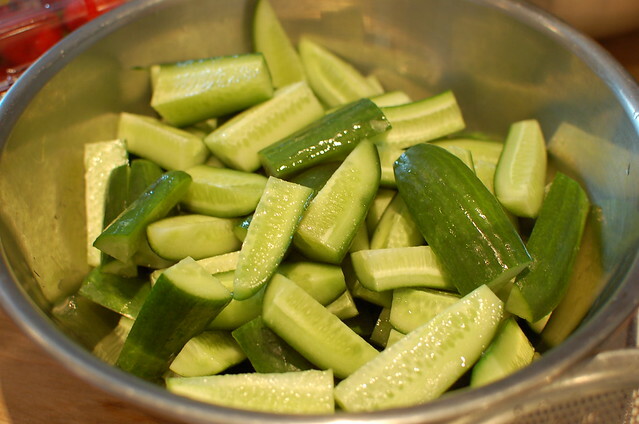 Cut Persian cucumbers in thirds widthwise, then in quarters lengthwise (length is about 2 inches). Put in medium/large size bowl and sprinkle kosher salt, layer by layer and stir. Let this sit for about 20 minutes, stir it up and let sit for 10 more minutes. The cucumbers should bend, but, not snap. Gently rinse cucumbers of excess salt. 3. 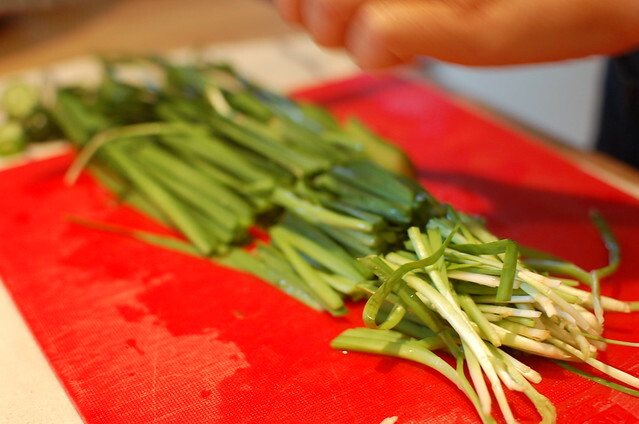 Take two handfuls of chives and cut at approx 3 inch lengths. 2. Finely grate ¼ of a whole onion (apple can be substituted). 3. 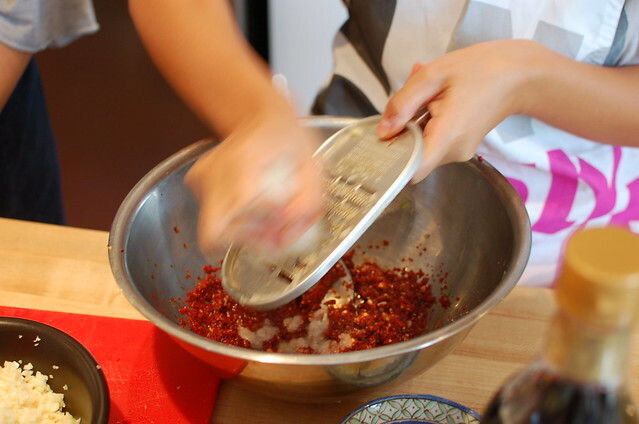 In a mixing bowl, mix/stir together fish sauce, korean ground red pepper, garlic, ginger, and onion. Once dressing is made, add the cucumber and chives and mix it all up with your hands. They are now ready to eat. Jar it, refrigerate and enjoy the days and weeks to come.